Lt Dineen, Tom, interrupted his graduate studies at the University of Pennsylvania to join the Marines because he felt we had to stop the spread of Communism in Vietnam, and he wanted to do his part. He was editor of his college newspaper and had founded and captained the rugby team at St Joe's College in Philly. He enjoyed tennis, cars, literature and foreign affairs. He was married and had a 3 month old son. 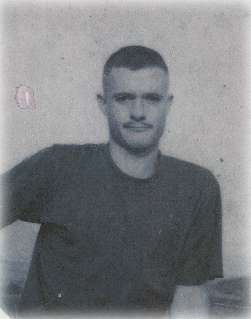 Lt. Thomas Dineen, Jr., the first Marine lost on Hill 25, August 10, 1967. I'd like to thank Steve" Doc" Hanmore for his friendship and his willingness to share with me his experience with Tom when they served together. Tom wrote home that he was proud of 2nd Platoon and felt they were good Marines. He enjoyed talking to them and learning about their varied backrounds. He said he admired and had great respect for Sgt Bolton, his experience and savvy.Tom also wrote he felt sorry for many of the Vietnamese natives who were poor, sore ridden and who didn't seem to understand the conflict. God bless 2nd Platoon and all who served in Mike 3/7. Click here to read more about Lt. Dineen! 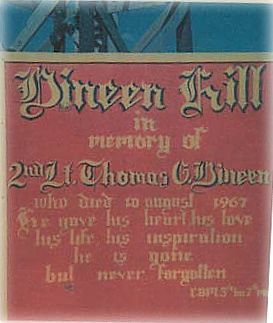 This sign was erected by the men of Hill 25, renaming it in honor of Lt. Dineen.